Source: Wikipedia, "Boogie Wings", available under the CC-BY-SA License. 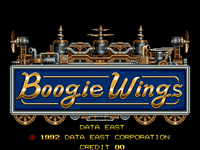 Boogie Wings (known in Japan as The Great Ragtime Show (ザ・グレイト・ラグタイムショー?)) is a side-scrolling shooter arcade game released by Data East in 1992. The game contains unique gameplay, along with many nonsensical or comedic themes not present in other games of the genre, but was never ported to other consoles because of its relative unpopularity in arcade centers. The game is set around the time of World War I, where the player maneuvers biplanes, automobiles, animals, and various other unidentifiable objects to battle an army of mech-wielding scientists. The player uses the 8-way joystick to control the biplane's movements, and the 2 buttons to shoot or hook enemies. The biggest characteristic of the player's biplane is the hook attached to its rear section. The hook is also controlled by the joystick, and enemies or objects that come in contact with the hook are dragged along by the plane. Dragged objects cause damage to anything they collide with, and the player can release the objects on the hook by pressing the hook button again. Dragged objects are destroyed when the player releases them from the hook, or if they collide enough times to break apart. The ship's power gauge increases when the player taps the shot button rapidly, and filling up the gauge causes the plane to shoot a bolt of lightning that covers a large area of the screen. However, the plane overheats if the player taps the shot button too many times, so this attack must be used sparingly. The game's graphics are highly detailed, and many of the backgrounds are likened to European towns and cities or World's fair-like scenes. Many of the game's background objects can also be destroyed or dragged around with the hook.